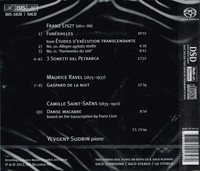 “BIS is proud to present a new disc from star pianist Yevgeny Sudbin who here combines works by Liszt, Ravel and Saint-Saëns. ‘Funérailles’ is Liszt’s elegy for his Hungarian countrymen who died in the 1849 uprising against Habsburg Rule. Death also appears in Ravel’s depiction of a hanging – ‘Le Gibet’ (The Gallows) from GASPARD DE LA NUIT – and closes the programme in Saint-Saëns’ ‘Danse macabre’. Love is present in the Petrarch Sonnets – originally song settings of poems in which Petrarch immortalises, the object of his unrequited passion – and Ravel’s ‘Ondine’ – the tale of a water nymph tempting a mortal to join her in the depths of the lake.